"White Privilege: That is the subject of this evening's 'Talking Points Memo.'" The Fox News host had a heated discussion with Megyn Kelly Monday night about the concept of "white privilege," during which Kelly defended the idea and the evidence that supports its existence. But apparently O'Reilly still wasn't convinced, because he was back at it Tuesday night with another important announcement. "Talking Points does not, does not, believe in white privilege," he said. O'Reilly went on to drop some statistics about unemployment and how Asian Americans have a lower unemployment rate than White Americans so really we should be talking about "Asian privilege." "There is no question that African-Americans have a much harder time succeeding in our society," he argued. "Even whites do. But the primary reason is not skin color. It's education and not only book learning." 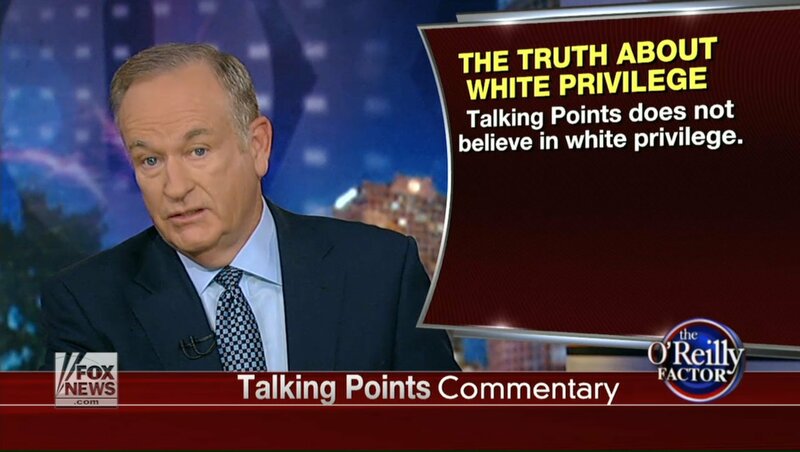 O'Reilly has been talking about the idea of white privilege for months now, denying that it's real but also making it known that he is "exempt" from white privilege because he once worked in an ice cream shop.